When you work on a computer all day (as most of us do), you learn to appreciate the power of keyboard shortcuts. I don’t know what I’d do with myself without the multitude of keyboard shortcuts that I constantly use in order to get things done. When I watch a novice computer user trip over menu selections, I’m always thankful for having taken the time to learn how to get things done quickly. Plus, let’s face it – making things happen with the keyboard just looks such much cooler than using a mouse. Have you noticed that they never use mice in Hollywood movies? It’s all keyboard commands, flashing messages and cool sound effects. But I digress. The only problem with keyboard shortcuts is that you have to learn them. There is that transition period where you have to make a conscious effort to stop using the mouse, and start using a shortcut that doesn’t yet come to you in an instant. Which is why I was delighted to recently stumble upon a Chrome extension for Gmail called KeyRocket, which helps you to learn keyboard shortcuts in no time at all. Vladimir revealed some awesome tips for making the most of Gmail in a recent post, and by using the KeyRocket extension, you will learn how to make even more of the hugely popular cloud-based email client. The extension was downloaded 10,000 times in its first week of release, and has a 4 1/2 star rating on the Chrome Web Store. Not bad. I have been using the extension for several days now, and I am already using quite a few of the different shortcuts that I wasn’t even aware of previously. Using KeyRocket is quite an intriguing experience – the perfectionist in me is actually quite irritated to see a message telling me that I could’ve done something quicker, but I get a great feeling of satisfaction when I use the shortcut the next time and am no longer prompted. KeyRocket is a rather unique application in that it is working at its best when you do not see it – i.e. when you are using all of the keyboard shortcuts available to you. But What if I Don’t Use Chrome/Gmail? At the risk of sounding like a Google fanboy, I can’t see any logical reason why you wouldn’t use Chrome and Gmail. In my humble opinion, they are at the top of their respective piles – nothing competes. I know that I am likely to arouse some dissent by saying so (and I would welcome constructive arguments against my opinion), but having an extension such as KeyRocket available solely on those two platforms is yet another reason to switch. So what are you waiting for? 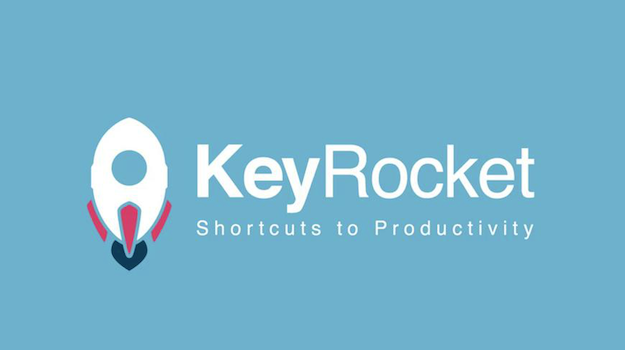 Download KeyRocket now and become an email productivity ninja! There’s already a version for Microsoft Office. I wish their was a version of this for the entire Office / Adobe Creative Suite Application sets….